Web Applications Desktop Integrator is a tool that leverages the standard desktop applications to perform some of the Oracle E-Business Suite task. The Web ADI brings Oracle E-Business suite to the desktop where familiar desktop tool like Excel can be used to create spreadsheet, enter and modify data in the spreadsheet and finally upload the data into the Oracle Applications. Web ADI can be very useful for the users who are experienced with Excel and will like to use excel to enter the data related to Oracle Applications. These users can use the special features of excel i.e. copy, paste, drag cells to increment and various arithmetic functions to optimize their business task and increase their productivity. Data that is entered into the spreadsheet can then be finally be uploaded in to the Oracle Applications with or without validation. Integrator - This is the definition that stores the information about the action the user wishes to perform. For example, downloading specific data to a spreadsheet for viewing or to modify and upload back to the database. API - Application Programming Interface. This is the pl/sql interface by which data is validated and uploaded into Oracle Application. You would associate an API with an integrator if it was intended to either create new data in the application or update data that had been previously downloaded. View - A view is an object by which you can query data on a table or tables. If the action you are intending to perform involves downloading data, you must associate a view with the integrator. If you are using Create style APIs, you do not require a view. You can elect to use a seeded view, for example, PER_PEOPLE_V, to use with your integrator. However, if the integrator is for updating data, then it is recommended that you create your own views and any other In/Out parameters used by your chosen API. One thing to beware of is the use of Aliases in views if you are downloading from a form. For example, if you use an alias for Applicant_Name called Starter, and then use a restrictive query in the form on Applicant Name before running the integrator in Web ADI, you will get the following error in the BNE log. BneBaseSQL.executeBneQuery: Exception while running query. Error Code: 904, Message: ORA-00904: "APPLICANT_NAME": invalid identifier. This column APPLICANT_NAME has been overwritten by the alias in the definition loaded into the BNE tables. 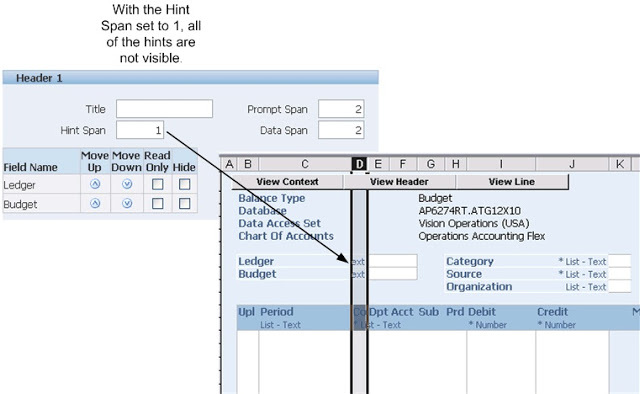 Layout - This is where the user selects the columns to be displayed in the spreadsheet or Word document from the API and/or View used by the integrator. An integrator can have more than one layout defined for it. You can choose which one to use when you create your document. Mapping - The mapping definition links the data source to the API columns. If no view is specified against the integrator or no text file used to load data, then no mapping is needed. When the data source is a view, the mapping is created automatically, however if a text file is being used then a mapping needs to be manually defined to associate each column in the file (source) to the relevant API parameter (target). To use WEB ADI with Microsoft 2007, macro settings need to be enabled, and browser settings need to be modified. 2. Click the Microsoft Excel Options button. 3. Click Trust Center in the menu on the left. 4. Click Trust Center Settings in the window on the right. 5. In the new window that opens click Macros in the menu on the left. 6. Under 'Macro Settings' check 'Disable all macros with notification'. 7. Under 'Developer Macro Settings' check 'Trust Access to the VBA project object model'. What? The creation of an integrator is a task that would be performed by a System Administrator who would need to analyze the business requirement, and then decide in technical terms how to achieve it. For example, if an upload or create type integrator, what API should be used? Also if not a create type integrator which view should be used to access the data in the database? If you create your own view, you can improve the quality of the document by formatting the columns in the view. Please note that there is no maintenance integrator so once the integrator has been uploaded, it is not possible to edit it if a mistake has been made. How? A detailed step by step guide on creating different integrators is included in the next section. However, in the HRMS Application, consideration has to be given to how the integrators are accessed. There are two types of Integrators, an Application Integrator and a Standalone Integrator. Application Integrators are linked to specific forms. The user uses the form in the Professional User Interface (PUI) to query data, and then exports that data using the Export Data icon. The standalone integrator is created with a form name of GENERAL. 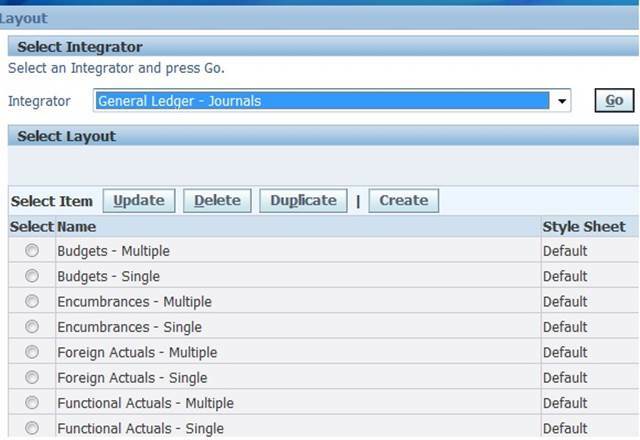 This then allows the integrator to be run from a self service menu by adding the function HRMS Create Document. Who? You control access to all HRMS Web ADI integrators using form functions. Existing form functions for seeded integrators are supplied and can be added individually to navigator menus or in their entirety by adding the submenus, HR ADI Seeded Integrator Form Functions and HR ADI Skills Seeded Integrator Form Functions. For user-defined integrators, you must create form functions and associate them to an integrator. You can be quite flexible on how to do this. A detailed step by step guide on creating form functions and associate them to an integrator is included in the next section. 3. Select Viewer as Excel 2007 and DO NOT tick the Reporting checkbox because you will be uploading a new integrator definition to the database. Click on Next button. 4. Choose None for Content to open empty document. Click on Next button. 5. On Document Creation Review page, Click on Create Document button and open file, A Processing window will open and a Confirmation window will advise when document has been created. 6. In the blank spreadsheet enter a value for each of the columns as follows. 7. Upload by going to Oracle menu on spreadsheet toolbar, and select Upload. This example demonstrates how to create an integrator that will allow the download the data and upload it to oracle application. 2. Select Integrator ‘HR Integrator Setup’. Click on Next button. This example demonstrates how to define an integrator that will allow the upload of new records into Oracle Application from spreadsheet and also using a text. 1. Select Integrator ‘HR Integrator Setup’. Click on Next button. 2. Select Viewer as Excel 2007 and DO NOT tick the Reporting checkbox because you will be uploading a new integrator definition to the database. Click on Next button. 3. Choose None for Content to open empty document. Click on Next button. 4. On Document Creation Review page, Click on Create Document button and open file, A Processing window will open and a Confirmation window will advise when document has been created. 5. In the blank spreadsheet enter a value for each of the columns as follows. 6. Upload by going to Oracle menu on spreadsheet toolbar, and select Upload. This example demonstrates how to define an integrator that will allow you to run ad hoc queries in the application. In this case running query on Last Name. 9. Upload by going to Oracle menu on spreadsheet toolbar, and select Upload. This example demonstrates how and which columns to be displayed in the spreadsheet. For each integrator there must be at least one layout. 2. Select Integrator for which you want to define layout. Click on Go button. 3. Select an existing layout to update or create a new layout by Click on Create button. 4. Enter Layout Name and number of headers to place across the top of the document. Click on Next button. 5. Select the fields to appear on the layout, set defaults for the fields, and select the placement of the field as context, header, or line item. Click on Next button. 6. Set properties for the layout components including field width or column span, hidden or unhidden, and position. Click on Apply button. • Header: Fields whose values do not change for every record you are uploading. This region appears above the line region in the spreadsheet. If you specified multiple headers, select the one you wish the field to display in (for example: Header 1, Header 2, or Header 3. • Line: Fields whose values change for every record that is uploaded to Oracle Applications. The rows of data in this region represent every record that will be uploaded. Default Types Note that some fields will have defaults predefined. Default Type - Constant Used when the text entered in the Default Value field is used as the default value in the spreadsheet. Default Type - Parameter Used to reference a parameter that your system administrator stores in the form function (Self Service Link) that you use to access the Create Document flow. The parameters that can be referenced are specific to each integrator. Default Type - SQL Used to run a SQL statement to determine the default for the field. Web ADI runs the SQL statement entered in the Default Value field and automatically populates the spreadsheet with the results. If more than one value is returned from the query, it uses the first value. • $profiles$.profilename: Returns the value for the current user's profile when you enter the name of the profile option. • $env$.userid: Returns the current user ID. • $env$.appid: Returns the current application ID. • $env$.respid: Returns the current responsibility ID. • $env$.language: Returns the current session language. Default Type – Formula You can enter Excel-compatible formulas as default values for fields. Follow the Excel formula syntax and enclose field names in brackets. Note that referencing the field names rather than the cell names prevents your formulas from being corrupted if the order of the fields is changed in the layout. • Protect Sheet - Select Yes or No to set the state of the document when downloaded. A protected sheet will allow you to update the data fields but will not allow you to insert rows. The user can change this setting in Excel by selecting Protection from the Tools menu. • Stylesheet - Select a stylesheet to apply to the document. • Apply Filters - select Yes to enable Microsoft Excel filters for the lines region when the document is downloaded. The user can change this setting in Excel by selecting Filters from the Oracle menu. • Data Span - enter the number of columns for the data to span. • Hide - select this box if you want the field hidden on the spreadsheet. • Read Only - select this box if you want the field to display as a non-updateable, read-only field. 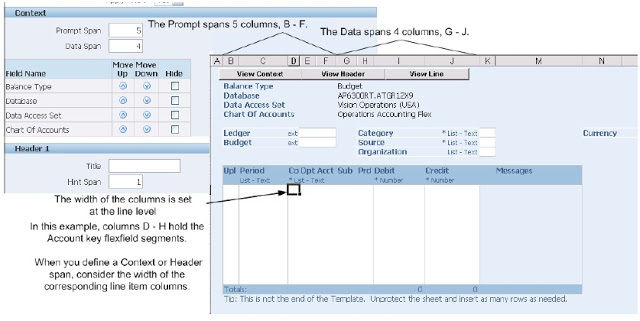 • Prompt Span - Enter the number of columns that the field prompt will span. Important: For context and header fields, you set the number of columns for the Prompt, Hint, and Data to span. You set the column widths for the fields at the Line level. Therefore, when setting the column spans for a header or context field, be aware that the width of a column is determined by the width of the line fields in the spreadsheet. • Title - (optional) enter a title for the header. 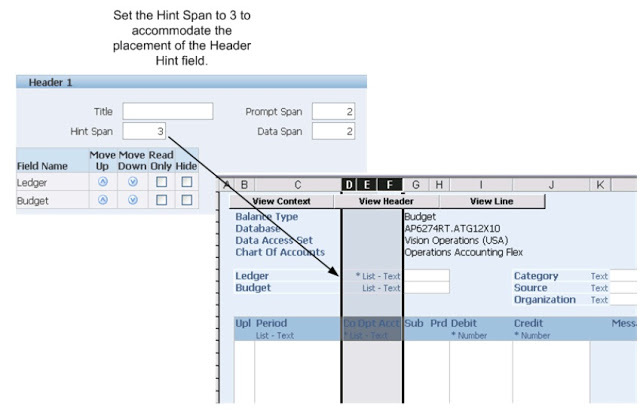 • Hint Span - enter the number of columns for the field hint to span. The hint for a field can include the following: * - indicates the field is required. • List - indicates that the field provides a list of values. Double-click the field to invoke the list. • Data Entry Rows - enter the number of blank rows to display when the document is generated. The user can add more rows once the document is downloaded to Excel. • Width - enter the width of the field in characters. • Frozen Pane - use this selection to set the fields that you want to remain visible while you scroll horizontally across the spreadsheet. This example demonstrates how to define mapping between source data and columns in a spreadsheet. 2. Select Integrator for which you want to define mapping. Click on Go button. 3. Select an existing mapping to update or create a new mapping by Click on Define mapping button. 4. Enter Mapping Name, Mapping Key and Number of columns. Click on Next button. 5. In the Define Mapping - Source to Target Columns window, associate columns being imported from the content to fields in the spreadsheet. 6. Click the list of values for the Source Column to view a list of available columns to import, and then enter the search criteria. (If you know the name of the Source Column, you can type it directly into the field without using the list of values.) Click the radio button next to the column name, and then click select to select columns to map. 7. Use the Target Column field next to each Source Column to create a mapping between the two fields. The Target Column list of values contains a list of columns that can exist in a spreadsheet. You may add new rows if more columns need to be mapped. Click the list of values for the Target Column to view a list of available columns to import, and then enter the search criteria. Click the radio button next to the column name, and then click select to select columns to map. 8. Some Target Columns support the translation of ID values from Source Columns. To find out if the translation of IDs is supported by a specific column, select that column and click Lookup. If the column supports the ID translation, a check box appears under Lookup for that column name. To perform the ID translation, select the Lookup check box for the desired columns. 9. Apply the mapping definition you have created. This example demonstrates how to call a WEB ADI from a responsibility menu. 1. Login to the application and navigate to System Administrator -> Application -> Function. 4. Query for a menu of a responsibility and add this function to the menu. 5. Go to the responsibility and run click on this menu. This example demonstrates how to create a LOV on an integrator field. Call the procedure BNE_INTEGRATOR_UTILS.CREATE_TABLE_LOV using below parameters. SELECT BIT.USER_NAME WEB_ADI, BA.ATTRIBUTE2 "PACKAGE", BCT.USER_NAME "VIEW"
Layouts enable you to customize the user interface presented in your spreadsheet. Use the layout functionality to determine the fields in a spreadsheet, set their positions, and specify default values for the fields. A layout must be available before you create a spreadsheet in the Create Document flow. Some integrators offer predefined layouts, or you can use the procedure described in this chapter to create a layout. Note: For some products, the layouts are predefined and preselected. Therefore you cannot select an alternate layout during document creation. the product-specific documentation for information regarding access to individual integrator layouts. Duplicate a layout from the list and save it under a different name. You can then modify this duplicated layout. Navigation: Oracle Web ADI --> Define Layout. Select the integrator. Existing layouts for the integrator will be displayed. 2. Select an existing layout to update or create a new layout. Choose Create to create a new layout; or, select an existing layout and choose Update to modify it. To create a new layout based on an existing layout, select Duplicate. 3. Enter a name for the layout and select the number of headers. Enter a Layout Name and specify the Number of Headers to place across the top of the document. If your document has one header, all fields that you identify as Header fields will display in a single list. If your layout includes numerous header fields, you may consider defining multiple headers to place them horizontally across the top of your document. placement of the field as context, header, or line item. 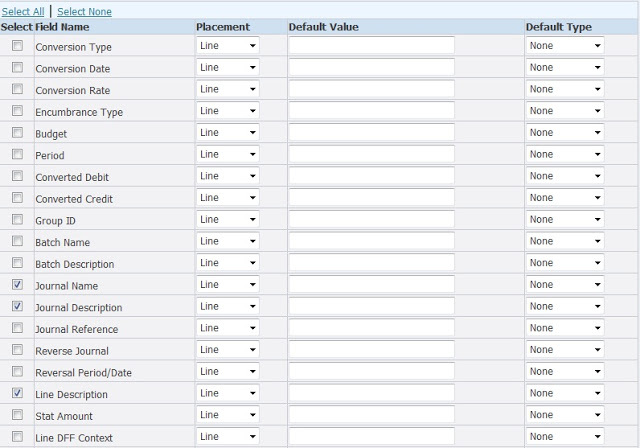 Determine the fields to be included in the Layout, their placement and default values. 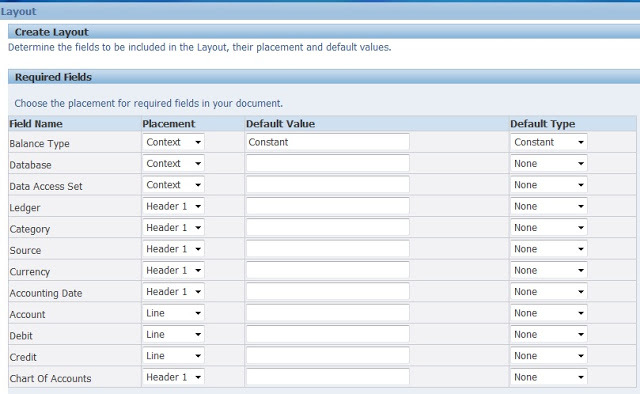 The page displays Required Fields and Optional Fields. Administering Web ADI 2-3 Some integrators offer the option Include Graph of Lines Data. Select the box to include a graph. • Context: Appears at the top of the spreadsheet as read-only, contextual information. Note that some fields will have defaults predefined. Used when the text entered in the Default Value field is used as the default value in the spreadsheet. Used to reference a parameter that your system administrator stores in the form function (Self Service Link) that you use to access the Create Document flow. The parameters that can be referenced are specific to each integrator. See the product-specific documentation for the valid values for the default type. Used to run a SQL statement to determine the default for the field. Web ADI runs the SQL statement entered in the Default Value field and automatically populates the spreadsheet with the results. If more than one value is returned from the query, it uses the first value. You can enter Excel-compatible formulas as default values for fields. Follow the Excel formula syntax and enclose field names in brackets. For example: [credit]+[debit] Note that referencing the field names rather than the cell names prevents your formulas from being corrupted if the order of the fields is changed in the layout. 5. In the Create Layout page, define display properties for the page components. Use this page to mark fields as Read Only, to Hide fields, and to move the fields up or down in the display order. • Protect Sheet - select Yes or No to set the state of the document when downloaded. A protected sheet will allow you to update the data fields but will Administering Web ADI 2-5 not allow you to insert rows. The user can change this setting in Excel by selecting Protection from the Tools menu. • Style sheet - select a style sheet to apply to the document. hidden or unhidden, and position. • Prompt Span - enter the number of columns that the field prompt will span. Important: For context and header fields, you set the number of columns for the Prompt, Hint, and Data to span. You set the column widths for the fields at the Line level. Therefore, when setting the column spans for a header or context field, be aware that the width of a column is determined by the width of the line fields in the spreadsheet. • * - indicates the field is required. • Data type - the data type for each field is always displayed. For example, Text or Number. • Read Only - select this box if you want the field to display as a nonrefundable, read-only field. The next example shows the Hint Span for the Header set to 1. In this case because the column that the hint falls into is narrow, all the hints are not displayed. To correct this for this example, expand the Hint Span to 3. The following figure shows the same document after increasing the Header Hint Span to 3. Note that achieving the desired layout may require several iterations, as changing the column spans for the fields in the first header will affect the placement of the fields in the second header. For example, in the preceding figure, when the Hint Span was changed to 3 for Header 1, the Hint text for Header 2 was moved to a narrower column resulting in part of that text being hidden.